I just wanted to write and say how pleased we were with the work you did for us yesterday, it was a first class job. You really are a great team together! You were punctual, polite, efficient, clean workers and most helpful with your explanations of how things worked as well as being helpful with your advice. Last but not least your prices were very fair and we shall definitely be calling you back for more work in due course. Deane and Brian replaced our fuseboard, rewired the garage, refed the conservatory and corrected an earth fault for us. Nothing was too much effort for this friendly family duo run business, who worked cleanly, quickly with minimal disruption. 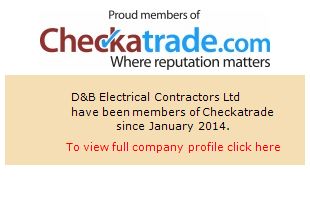 We certainly got value for money and wouldn’t hesitate in recommending them to anyone and using again in the future! Just to say that Brian & Deane are excellent workmen and would thoroughly recommend them to do what ever work was needed. I can call any time and they will come at a moments notice. This job Started in September this year, our customer in question had a Stable block, New Kitchen extension & Utility and a Garage erected for which we provided services for. Excellent service, prompt, reasonable and reliable. Would highly recommend for any job large or small. Brian was quick to respond and attended to the fault within an hour of making contact. He identified the fault, and its cause, swiftly and took the required remedial action to overcome it immediately and in a very professional manner. Throughout the entire process, Brian kept me abreast of everything he was doing and proposing to do. I recommend him without reservation.